N64 on Virtual Console, boyee! It's an auspicious day in Virtual Console history, as the service receives only its second third-party N64 game in the West, after Ogre Battle 64: Person of Lordly Caliber. It's certainly the highlight of what is otherwise a rather underwhelming download this week. 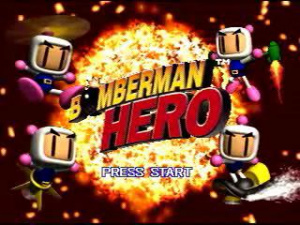 Bomberman Hero (Hudson Soft, N64, 1000pts) — This single-player bomber outing divides players due to its complete lack of multiplayer modes, but it still holds a special place in many gamers' hearts. We'll bring you a full review in the near future to let you know if this is worth your 1,000 Nintendo Points or not. Successfully Learning Mathematics: Year 2 (Tivola, 800pts) — Don't worry, you haven't missed Year 1: this maths educational aid from Tivola features a number-loving vampire (a ah ah!) and even a hidden minigame, promising to help children "learn about the world of mathematics in a fun and accessible way". We'll do the sums and come up with an integer between 1 and 10 to describe our feelings. Lead the Meerkats (Lapland Studio) — A decent attempt at trying to break the lucrative meerkat simulator market, now you can try out the game before putting your 1,000 Nintendo Points down for the full version. Read our Lead the Meerkats review to help you in your purchasing decision. Puzzle to Go Sightseeing (Tivola, 500pts) — A tourist-themed take on the Puzzle to Go formula which looks unlikely ever to change. Our Puzzle to Go Planets and Universe review is a write-up of the previous game in the series, so don't expect much to change in this new sightseeing title. The Seller (CIRCLE Entertainment, 500pts) — We called this " the most convoluted and fun-deprived card game on DSiWare" in our The Seller review. That should tell you all you need to know. Monster Buster Club (Nordcurrent, 800pts) — Another minigame compilation from the endlessly innovative team at Nordcurrent, we'll have a review available shortly as the game launched in North America on Monday. Get the lowdown on the latest WiiWare, Nintendo DSiWare and Virtual Console games available for download this Friday! In Successfully Learning: Mathematics, Year 2 on WiiWare this week, learning and playing make the perfect combination. With the help of a little vampire, Freddy, you’ll find solving mathematics problems is child’s play! And if you enjoy Successfully Learning: Mathematics, Year 2, be sure to look out for the release of higher Maths grades on WiiWare over the course of the coming weeks. On Virtual Console this week is Bomberman Hero, a single player action game which will see you flying, swimming, shooting and bombing your way through the galaxy on your mission to save Princess Millian. Nintendo DSiWare this week sees players being tasked with a visual conundrum in the form of Puzzle to Go Sightseeing, while The Seller is fun card game with a few simple rules that offers a brain-teasing test of your intelligence. Prefer some more fast paced action, then look no further than Monster Buster Club, where your mission is to prevent an alien invasion. In Successfully Learning: Mathematics, Year 2, “pupils” team up with a little vampire, Freddy, to solve maths problems together. By partnering with Freddy and supported by the tips and advice offered along the way, Successfully Learning: Mathematics, Year 2 motivates children and helps them learn about the world of mathematics in a fun and accessible way. And as a reward for all your hard work, you will discover the ability to unlock new levels to a fun, bonus game! Popular hero, Bomberman, returns in his own full-on action game - Bomberman Hero! When a spaceship crash-lands on Planet Bomber, Bomberman journeys to the Peace Mountains to investigate and encounter Pibot, the dazed robot pilot. According to Pibot, the evil Garaden Empire carried out an attack on Primus Star, kidnapping Princess Millian from Pibot's escape ship in the process. Bomberman’s mission becomes clear and he vows to save the princess, even if he has to travel the length of the galaxy to do it! Equipped with an infinite supply of bombs, Bomberman’s search for the princess takes him to five planets, reuniting him with his old friend Louie and uncovering all-new items and a variety of upgrades to aid him in his quest. Are you ready to help Bomberman succeed in his mission? Puzzle to Go Sightseeing is a jigsaw puzzle game for those who like to be challenged when on the move! Faced with perplexing imagery, your challenge is to solve the puzzles in order to create beautiful motifs... wherever and whenever you like. Each motif is available in three different degrees of difficulty (from a 68, 88 or 130 piece jigsaw) and players will collect stars for each completed jigsaw puzzle, thereby releasing new images to enjoy. You can even decide for yourself which images you wish to puzzle together because Puzzle to Go Sightseeing allows you to puzzle together all the images from your Nintendo DSi photoalbum. In The Seller, you play a down and out big-time boss, who has hit the small- time after your company was forced into bankruptcy by an underhand competitor. Your aim is to get revenge...a dish best served cold over a drink and a game of cards at a high-class bar. Are you ready to rebuild your fortune and show your competitor who is boss? This is a witty card game with a few simple rules to test your intelligence. Earth is about to be invaded by evil aliens and their first stop is Singletown. However, they haven’t reckoned on the abilities of the Monster Buster Club, who are on hand to save the day! Join Cathy, Danny, Sam and Chris in this exciting adventure game, based on the hit animated TV series Monster Buster Club, and help stop these troublemakers from taking over. With four playable characters, a wide variety of puzzles and challenges to overcome and exciting gameplay features to test your speed and timing, Monster Buster Club offers a fun-fuelled adventure game for players of all ages. Nothing for me, I have a date with a Tepig tonight. Looking forward to the Bomberman Hero review. How's Bomberman Hero? I remember the commercials making it look like a fun game. I was really enjoying the Lead the Meerkats demo. Expanding the burrow, trying to find food, get baby meerkats, letting them grow up. And all of the sudden I'm fighting a bird by making boxing moves and it hardly looked like I did any damage. Who came up with that stupid idea. I was considering buying it, but this makes it a no go. Sneaker: Good thing you didn't buy it because the game is awful. Glad a VC game was released, but it ain't no Monster World IV or Super Hang-On..
@Kevin It's a little different from Bomberman 64 as you can jump and you have a life bar (though pits can still one shot you, nothing else can). Bombs explode on contact with walls, obstacles and enemies (unless you drop a bomb). Certain levels have alternate paths that can take you to different levels. And vehicle/pet riding gameplay, there's a nice variety in the vehicle levels and make for a good change in pace. Yay, Bomberman Hero! Hope that comes to NA soon, too. Hasn't been an N64 ga,e released on either side of the pond in a long time. nothing to me next week hope good one! Bomberman Hero is a pretty damn good game. Definately worth $10. I think I'll celebrate by playing my cart. Looking forward to the Bomberman Hero review as well. Here's hoping Bomberman Hero comes to NA ASAP. Bomberman Hero has to come Monday. It just has to! we in NZ only got bomberman hero, nothing else (on either system).